Customers are changing the way they buy. Why aren't you changing the way you sell? Today's customers have more buying options than ever before. They don't care if it's direct or indirect. They don't mind if it's not your preferred sales model. And they don't like it when you try to tell them how to buy from you. If you want your customers to keep buying - and your company to keep growing - you need to rethink and retool the way you're selling. You need to go "hybrid". Sell more. Grow your sales organically and exponentially faster. Sell more efficiently. Align the right resources from all sales channels to the right selling opportunities. Sell in the ways that customers want to buy. Focus on how your customer buys, not on how you want to sell. Developed by the sales performance leaders at MHI Global, this test-driven, customer-based approach to selling will revolutionize your sales channels, reenergize your sales teams, and reignite your sales growth - efficiently, holistically, and rapidly. This is the future of direct and indirect sales, a newly organized, easily implemented sales model inspired by a changing market and empowered customer base. With The Hybrid Sales Channel, you'll have the best of all worlds - and get the best of all results. If you're like most companies, you probably think your direct and indirect sales channels are more than sufficient for handling customers' needs - and you don't need to spend time or money developing a "hybrid" version of what you already have. But the truth is: You do. The truth is: A higher and higher percentage of customers are buying through partners and less through direct channels. 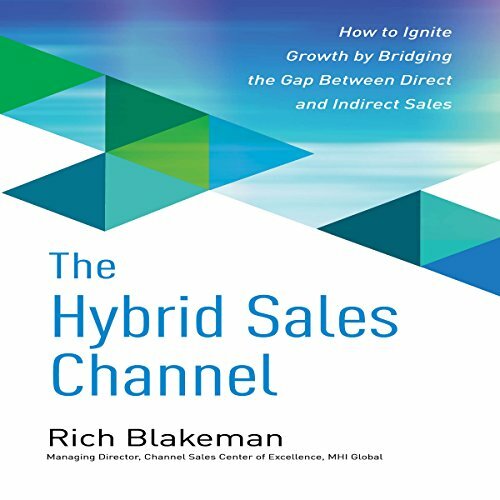 The truth is: You need to adapt to the market - and you need to do it now - using The Hybrid Sales Channel. However you decide to sell your products or services, the customers will ultimately decide how they want to buy them. The Hybrid Sales Channel gives you the tools you need to adapt to changing customer habits in the fastest, most efficient way possible. a quick listen on the key aspects behind a cohesive omni-channel strategy. great examples and insights. well worth the listen.